Distance Learning - Eastern Wyoming College - Eastern Wyoming College - It's A Great Decision! Eastern Wyoming College has a robust distance learning program, including several degrees and certificates that can be earned entirely at a distance. Individual distance classes are available to satisfy a number of general education requirements and electives. Please see the links at the right for class schedules and future planned offerings (rotation schedule). As an approved WC-SARA institution, EWC is able to legally offer distance learning in all SARA member states. Please follow this link for more information about SARA and to view the current list of states and U.S. territories participating in SARA. Additional links to the right provide documents you can read or print that will help you navigate our learning management system or become a better distance learning student. Click the links below to expand their information as they relate to distance learning. The EWC Distance Learning Committee has established the following vision and mission statements as related to distance learning. Eastern Wyoming College will provide a dynamic and engaging distance learning environment that facilitates individual growth, inclusiveness, community involvement, and global impact. Eastern Wyoming College strives to provide quality distance education opportunities and experiences to all students engaged in online learning by meeting their educational, cultural, social, and economic needs. This flexible Associate of Applied Science degree program provides an individual with entry level business skills with emphasis in accounting, office management, and computer areas. It will prepare the student to work in a variety of office and business occupations. Many career opportunities are offered with a criminal justice background. This AA degree program will help prepare you for this fast growing occupational field. Each semester, you will gain practical experience through a real-world early child education setting. Our program will also get you ready to continue your education, as most of our early childhood education courses have been articulated with the University of Wyoming and Chadron State College for credit transfer. EWC will help you train online at a pace that’s right for you, with support from early childhood education instructor, Catherine Steinbock. You will study curriculum development for preschoolers and other young children, guidance procedures, and how to promote language, literacy, and social skills development. This Associate of Arts degree offers a unique opportunity to begin the teacher certification process from the comfort of your own home and in your own community. The Associate of Arts (AA) and Associate of Science (AS) degree programs offer a broad-based degree, which includes all general education courses and allows the student to choose electives. Both of these degrees transfer well to four-year colleges and universities. Online registration is available to students who have met with an adviser. Please follow the instructions found at Registration/Records. Otherwise, please contact the EWC Torrington campus or any EWC Outreach Office. Tuition & fees: Standard tuition and fee rates apply. None of the classes at EWC require an additional distance learning fee. How comfortable are you with using technology such as computers, e-mail, and the Internet? Are you a self-directed, self-motivated, and self-disciplined student? It is important to keep to a schedule with distance courses. Do you like the face-to-face interaction of a traditional course or do you think you would be comfortable with other forms of interaction such as chat rooms, e-mail, or telephone calls? Do you have the time commitment to devote to a distance course? Distance classes require as much or more of your time than traditional classes. Are you willing to be an active participant and an advocate for your own education? You will need to work according to your own schedule and be willing to contact the instructor or other college personnel when you have questions. Does the college have current information about you? It is very important that the college have current contact information for you such as name, mailing address, phone number, cell number, and e-mail address. 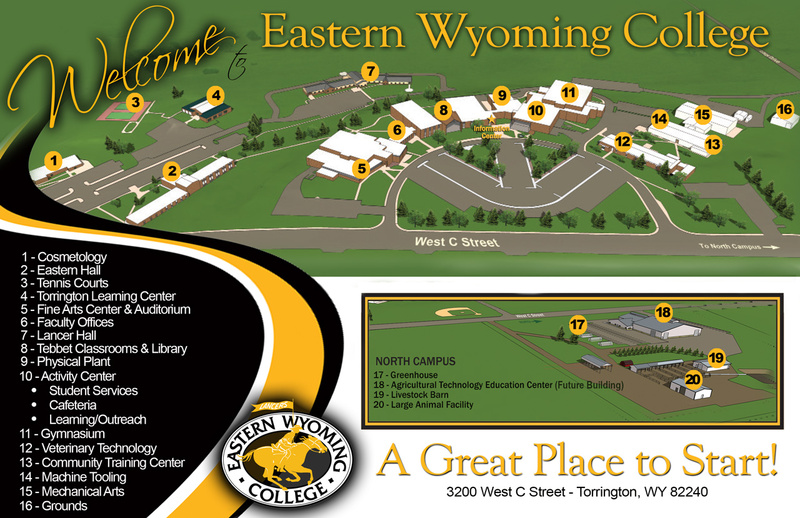 Eastern Wyoming College uses the CampusCruiser LMS from CampusCruiser. The system features typical course interaction tools including message board forums, a personal journal, chat, online assignment upload, online testing, structured course content, blogs, and photo albums. User account login information will be sent to you by e-mail or available for pick-up from the Instructional Technology Office, VPJAC 115 on the Torrington campus. Please view the CampusCruiser Section 508 Statement and CampusCruiser Section 508 VPAT pages for information related to LMS accessibility. Because course material is available through the World Wide Web, access to the Internet is required. Computer skills and familiarity with basic Internet services (like e-mail) are highly suggested. Information regarding access to materials will be sent to the student prior to the first day of class. In addition, a textbook and study guide may also be required. Some courses may require purchase of an "access key" from the textbook publisher. These courses have no extra fee. EWC uses a course management system from CampusCruiser, known as LancerNet on campus. You can check your computer and web browser for compatibility with LancerNet using the LancerNet Browser Checker. These courses meet on specific days at specific times using web conferencing software over the Internet and the World Wide Web and other features of the class are also online. Students will need a headset with microphone connected to their computer. A web camera is optional. These courses have no extra fee. You can check your computer and equipment for compatibility with WizIQ using the WizIQ System Test page. Students who believe the college or its employees have treated them unfairly or inequitably may seek resolution through the student grievance policy. View the Student Conduct and Complaint Process web page for more details. The Vice President for Student Services, Dr. Rex Cogdill (rex.cogdill@ewc.wy.edu), is available to review the policy with students. Grievances may be addressed through an informal resolution, formal resolution, or grievance hearing. Sexual misconduct violations are referred to the Title IX coordinator, Dr. Rex Cogdill (rex.cogdill@ewc.wy.edu), and addressed in the Sexual Misconduct policy. In the case of a student who is taking a distance education class and does not live in the area, all meetings may be conducted via phone or web conference. Please contact the acting Vice President for Academic Services, Roger Humphrey (roger.humphrey@ewc.wy.edu), to begin this process. Complaints about grade appeals and conduct complaints are excluded from the state process and need to be settled with Eastern Wyoming College. The following people are dedicated to making your distance learning experience a positive one. Please contact them if you have questions or comments concerning distance education at EWC.